Cockerell, Douglas B. Special bindings for “The land of the New Adventure” by Dr. William Inglis Morse. [Letchworth, Herts, England: D.B. Cockerell, 1932.] leaves; photographs; 24 cm. 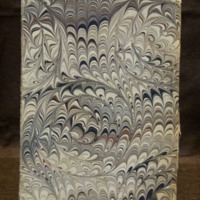 Handmade volume by Douglas Cockerell was made for presentation to his client William Inglis Morse. Photographs of the twenty unique bindings designed by Cockerell for Morse’s book The Land of the New Adventure are accompanied by Cockerell’s autograph notes. Two other Cockerell fine bindings are also illustrated; a binding for a book of poetry by George Meredith and for Marlow’s Doctor Faustus. Cockerell may have made a second copy of the binding catalogue for his own records but it is unlikely that he would have taken the time to assemble many copies. Total number of copies unknown. 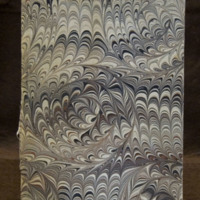 This hardcover, heavy book board is covered with book cloth marbled in a Cockerell pattern using brown, black, gray, and cream inks. The text is made up of heavy paper sheets that are hand sewn onto endpapers of the same heavy paper stock. A printed “Cockerell Bindery” label is on the front inside cover with the catalogue title in Cockerell’s handwriting. This volume includes fourteen black and white photographs of Cockerell’s fine bindings, which are attached to the rectos of the book leaves; the manuscript notes are to the right of or beneath the photographs. On the inside front cover is a William Inglis Morse bookplate and label. On the back inside cover is another Morse bookplate, and a Morse stamp is embossed on the front and back flyleaves. Even though the binding is very basic and the volume is intended as a record of binding designs, the beautiful marbled covers make it a work of art. Cockerell’s cryptic manuscript notes offer an interesting insight into the bookbinder’s viewpoint.